216 pages | 2 B/W Illus. This cross-disciplinary volume brings together diverse perspectives on children’s food occasions inside and outside of the home across different geographical locations. By unpacking mundane food occasions - from school dinners to domestic meals and from breakfast to snacks - Feeding Children Inside and Outside the Home shows the role of food in the everyday lives of children and adults around them. 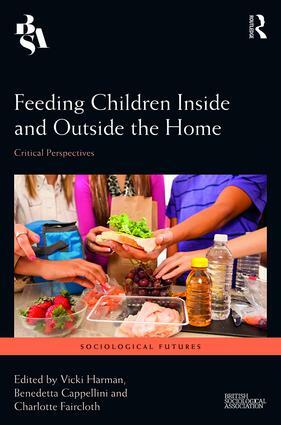 Investigating food occasions at home, schools and in nurseries during weekdays and holidays, this book reveals how children, mothers, fathers, teachers and other adults involved in feeding children, understand, make sense of and navigate ideological discourses of parenting, health imperatives and policy interventions. Revealing the material and symbolic complexity of feeding children, and the role that parenting and healthy discourses play in shaping, perpetuating and transforming both feeding and eating, this volume shows how micro and macro aspects are at play in mundane and everyday practices of family life and education. This volume will be of great interested to a wide range of students and researchers interested in the sociology of family life, education, food studies and everyday consumption. "This is a fascinating and highly relevant edited collection relating to children’s lives and food practices. Across the book we learn the ways that social contexts shape and inform what children eat across different countries and cultures. Whilst parenting is a key component of the analysis within several chapters this is usefully set within a broader context to acknowledge that family food work is influenced by settings beyond the home, with broader discourses about health, intervention and surveillance of families critically exposed." "In this timely collection the editors shine a much-needed light on ‘feeding children’ as a political practice at the centre of social reproduction. Uniquely bringing together insights from across disciplines, countries and settings, the book will be essential reading for students and researchers in the sociology and anthropology of food, childhood and women’s studies." "The scope of this collection of essays, including its global reach, makes it genuinely thought provoking. It is far more than a collection of stand-alone essays about feeding children. Knitted together with reference to wider sociological themes throughout, the collection will be of interest not only to sociologists of food, but also those interested in family, parenting cultures, gender, policy making and methodological questions raised by comparative research." Part III: NEW PARENTING STYLES? Vicki Harman is a Senior Lecturer in Sociology at University of Surrey. Her research interests include family life in contemporary Britain and social divisions including gender, social class and ethnicity. Vicki has conducted qualitative research into food practices within families, focusing on feeding the family on a low or reduced income and parents’ perspectives of preparing lunchboxes for their children. She has published her research in journals including Sociology, Ethnic and Racial Studies, Identities: Global Studies in Culture and Power, Young Consumers, International Journal of Consumer Studies and the British Journal of Social Work. Benedetta Cappellini is a Senior Lecturer in Marketing and Consumer Behaviour at Royal Holloway, University of London. Her research interests are in food consumption, material culture, family consumption and motherhood and consumption. She has published in journals including Sociology, The Sociological Review, Consumption, Markets and Culture, Journal of Marketing Management, Journal of Business Research, Journal of Consumer Behaviour and Advances in Consumer Research. She is the co-editor of The Practice of the Meal: Families, food and the market place (Routledge, 2016). Charlotte Faircloth is a Lecturer in the Sociology of Gender at University College London. Her research interests include parenthood, infant feeding, gender, intimacy and equality. She has published in journals including Sociology, The Sociological Review, Health, Risk and Society and Ethnos. She is the author of Militant Lactivism? Attachment parenting and intensive motherhood in the UK and France (Berghahn Books, 2013), co-author of Parenting Culture Studies (Palgrave, 2014) and co-editor of Parenting in Global Perspective: Negotiating ideologies of kinship, self and politics (Routledge, 2013). Sociological Futures aims to be a flagship series for new and innovative theories, methods and approaches to sociological issues and debates and ‘the social’ in the 21st century. This series of monographs and edited collections was inspired by the vibrant wealth of British Sociological Association (BSA) symposia on a wide variety of sociological themes. Edited by a team of experienced sociological researchers, and supported by the BSA, it covers a wide range of topics related to sociology and sociological research and will feature contemporary work that is theoretically and methodologically innovative, has local or global reach, as well as work that engages or reengages with classic debates in sociology bringing new perspectives to important and relevant topics. The BSA is the professional association for sociologists and sociological research in the United Kingdom, with an extensive network of members, study groups and forums, and a dynamic programme of events. The Association engages with topics ranging from auto/biography to youth, climate change to violence against women, alcohol to sport, and Bourdieu to Weber. This book series represents the finest fruits of sociological enquiry, for a global audience, and offers a publication outlet for sociologists at all career and publishing stages, from well-established to emerging sociologists, BSA or non-BSA members, from all parts of the world.